« Grand Cayman was a Grand Time! Are you sick of our vacation posts by now?! Well, they’re all done so you now we can focus more on the wonderful season of FALL! It’s my all time favorite season. However, fall is officially over in Sidney, as we are currently having a blizzard! We had our first snow yesterday…of course over Oktoberfest weekend. Oktoberfest in Sidney is a pretty big deal. We all look forward to it throughout the year, so it’s a huge bummer when the weather is crummy. I helped my friend,Tess, at her cotton candy stand yesterday, which was fun but quite chilly. We were supposed to have the annual Oktoberfest parade this morning (which I’m in with my dance team girls), but it was cancelled because of the snow. It’s been falling since early this morning and we’re currently sitting at about 5 inches. I must say it’s pretty beautiful, but I wasn’t ready to winter yet! On to more fun things. I decorated for Fall last weekend! We made a trip to Hobby Lobby in Cheyenne, WY for some supplies. I decided I wanted to make a festive, original DIY Fall wreath. I found awesome inspiration from my new favorite blog- Shanty2Chic. You should definitely check it out- they have such unique, cute DIY projects. I followed her tutorial for the DIY Fall Wreath to make one. I added a little embellishment to mine, which was also found on her website. 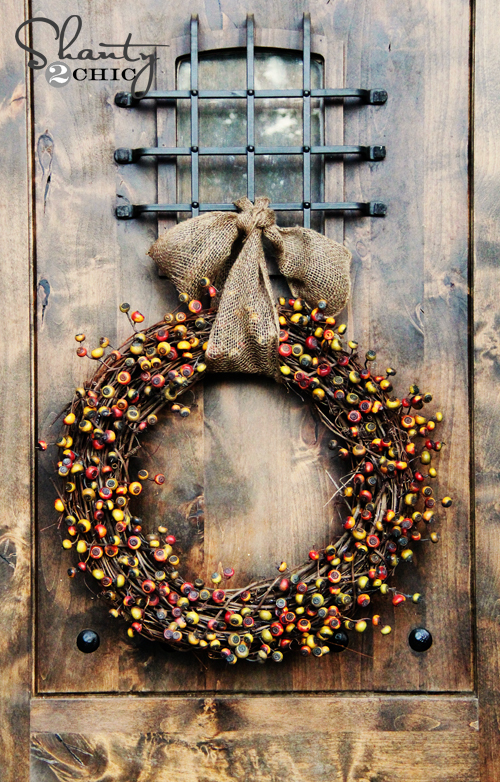 And I found more inspiration from Sweet Daisy Design’s blog for another fun DIY fall wreath. Thank you fellow bloggers for all of your awesome tutorials and ideas! I just love perusing the blogosphere for fun weekend decorating projects. So, here is my own diy fall wreath and step by step on how it all came together. I had this grapevine wreath sitting in the basement. I had decorated it for Christmas one year, so I removed those decorations so it was blank. Then I used a wire cutter to cut off individual strands of berries from a bouquet of fall berries from Hobby Lobby. I used my hot glue gun to adhere the berries to the wreath. Easy enough, right! Then I just tied a burlap bow, cut off the ends that were showing, and hung it up! I was getting the feeling that it looked a bit sparse. To take care of that, I made rosettes out of burlap and hot glued them on. I think it made it really come together nicely. 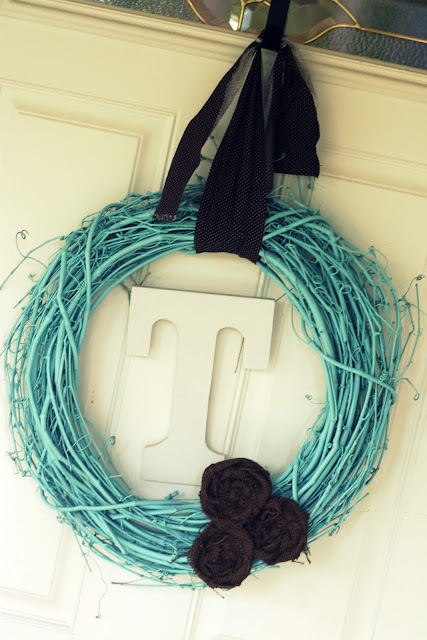 For the second wreath, I wanted to incorporate a monogram “R”. First, I spray painted the R with beige spray paint and a light coat of this bronze metallic over the top. I used a small grapevine wreath that I got at Target for $2.50 Here are the supplies: Burlap ribbon, wreath, wire cutters, hot glue, and small pumpkins. I just hot glued the pumpkins on, and added some fall berry embellishment. Then I tied on the R with the burlap ribbon. I also used a brown ink pad around the edges of the letter to make it look antiqued. Lastly, I bought some paper mache letters that spelled FALL at 99 cents a piece. I knew that if I painted them with the metallic spray paint, they would look metal…and indeed they do! What an inexpensive way to bring the season into your home! Each wreath cost me under $5 to make, and the Fall letters were only $4. It’s so refreshing to know that it doesn’t take a lot of time or talent to make your home feel cozy and seasonal. Happy fall to you! Our first Red Rocks Concert! I LOVE this fall post! I can see your wreath and all the the other decorations so much clearer on this than on the phone pictures. You did a great job! Today has got to make you feel like Christmas! Ironically, Lydia had posted on fb this morning that she was thinking of Christmas. I shared your snow on my page, so hopefully she can see that you’re probably really thinking of Christmas in October!!! You do a great job of making your house a home. I hope your cornbread turned out well today, mine did! Love ya! Love your post! Simple and creative ideas for the Fall! Put me in the spirit to get out my decorations. You are right about the winter already being here. Madi asked yesterday if we could play Christmas Music because it seemed like that holiday with the snow that fell this weekend. I refused and told her we were going to have to tough it out for a couple of months. Always enjoy reading your posts. Keep up the great creative posts.